Would Venom be able to take down Spawn? My guess...no. I decided to try to stage a fight in MUGEN. venom doesnt feel pain plus his suit is so thick that spawn might not be able to even snap his finger and spiderman has tried a lot worse so HA! The writer would determine the outcome... and if it came out to a battle it could go either way. 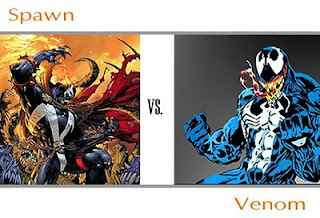 Venom has gone toe to toe with being much stronger than himself including the Juggernaut and Ghost rider without any type of power boosts (who are magic powered fyi). Venom isn't out form this fight even by a long shot. the alien symbiote can take a heft beat down and isn't given the respect it deserves.